I never thought I’d see a 1939 film were one of the biggest stars at the time would completely disappear in a role like it was the worlds greatest magic trick. But “The Private Lives of Elizabeth and Essex” certainily proved me wrong by turning Bette Davis into the living embodiment of Queen Elizabeth I. From the makeup and costumes to the mannerisms to the subtle way she holds herself around her subjects and around Lord Essex (Errol Flynn) in private, I never once thought I was watching an actress trying to imitate one of the most famous English queens. But what really sold me was her dialogue, how it was practically dripping with regret and loss, how it was killing her to be queen and how much she wants to just be a woman. There is so much heartache in those words and so much passion in Davis’ performance that it makes her one of the most tragic characters in all of cinema. 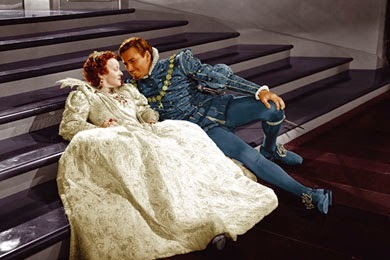 It’s too bad Errol Flynn’s performance as her forbidden lover does not reflect this towering performance from Davis. Flynn gives the same type of macho, chauvinistic performance we’ve seen in “The Adventures of Robin Hood” and “Captain Blood,” and his action hero one-liners and witty comments do not mix with Davis acting her heart out. At times, he feels like a child trying to perform Shakespeare alongside a professionally trained actress. I never once felt like these two were truly in love, though it was always Flynn at fault, never Davis. Overall, if you want to check out “The Private Lives of Elizabeth and Essex,” watch it for Davis’ performance, the beautiful technicolor cinematography and the elaborate outfits and makeup that all truly capture a more elegant time period.